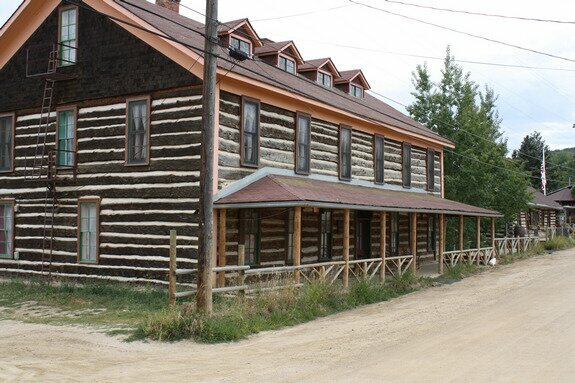 Gold Hill has the distinction of being the first permanent Colorado town in the mountains, in 1859. Ken's books go into the history in depth. The mines closed in the 1930s. Today, the town is permanently occupied. To wander through this town gives one the feeling of being in a bygone era. Displaying Gold Hill photography page 1 out of 2. Date Taken: 2009:09:10 14:31:25 Want to use this image? See the More information tab. Date Taken: 2009:09:10 14:32:31 Want to use this image? See the More information tab. Date Taken: 2009:09:10 14:33:54 Want to use this image? See the More information tab. Date Taken: 2009:09:10 14:34:27 Want to use this image? See the More information tab. Date Taken: 2009:09:10 14:34:41 Want to use this image? See the More information tab. Date Taken: 2009:09:10 14:35:18 Want to use this image? See the More information tab. Date Taken: 2009:09:10 14:35:51 Want to use this image? See the More information tab. Date Taken: 2009:09:10 14:36:25 Want to use this image? See the More information tab. Date Taken: 2009:09:10 14:36:53 Want to use this image? See the More information tab. Date Taken: 2009:09:10 14:37:08 Want to use this image? See the More information tab.